The Radisson Blu Portman Hotel provides comfortably elegant accommodation near Oxford Street shopping and the major attractions of Hyde Park and Buckingham Palace. The hotel’s rooms range from well-appointed standard to stunning penthouse. The restaurant and bar welcome you to fresh, well-crafted fare in a genial setting. Our fully equipped fitness centre, outdoor tennis court and spacious event facilities offer everything you need for a remarkable stay in a renowned city.The hotel’s spot in the London West End offers enviable proximity to several Tube stations.Each of the 272 rooms, including suites, showcase stylish design with comfort at its core.Free high-speed, wireless Internet access is available to all guests and meeting delegates.Portman Corner Restaurant proudly serves fresh, inventive international cuisine, traditional afternoon tea and the sumptuous Super Breakfast Buffet.Club Twenty Two houses a full complement of cardiovascular and training equipment, a sauna, and a steam room; you can also enjoy the outdoor tennis court on Portman Square.The hotel’s dozen meeting suites and 600-person-capacity ballroom make up one of the largest conference and banquet facilities in London. 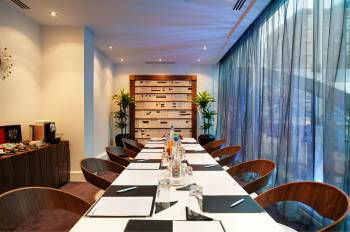 Plan exceptional West End events in ideally located London meeting roomsFor a six-attendee board meeting or a theatre-style conference for 600 delegates, these London meeting rooms prove perfect. Their incredible location near Oxford Street shopping, major city attractions and public transportation make them ideal for gatherings of all kinds. Natural light streams through floor-to-ceiling windows, and Free high-speed, wireless Internet access keeps delegates connected and productive. The hotel’s Meetings & Events staff will work tirelessly to make your occasion a success.The first floor of the Radisson Blu Portman Hotel is dedicated to conference and banquet facilities, with a separate entrance to allow clients instant access to the meeting space. A grand ballroom and 12 conference and banquet suites become even more appealing with customised event menus by the award-winning chefs at Portman Corner Restaurant.